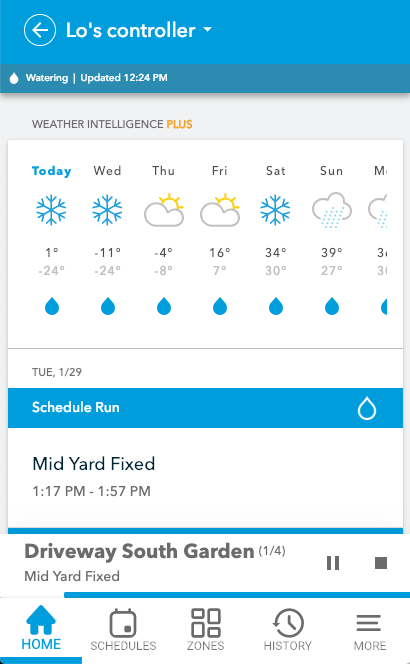 Rachio lets you skip or delay watering if needed, and provides a couple of options to choose from depending on your scenario. Manual Delay postpones watering events within 24 hours. Recommended for pushing off or delaying a watering for a certain time period (for example, if you don't want to water during a BBQ or open house). Skip will remove or skip over the next immediate watering (not multiple watering events). Recommended for skipping a specific schedule run. Can be used to skip watering if you decide your plants have enough water. 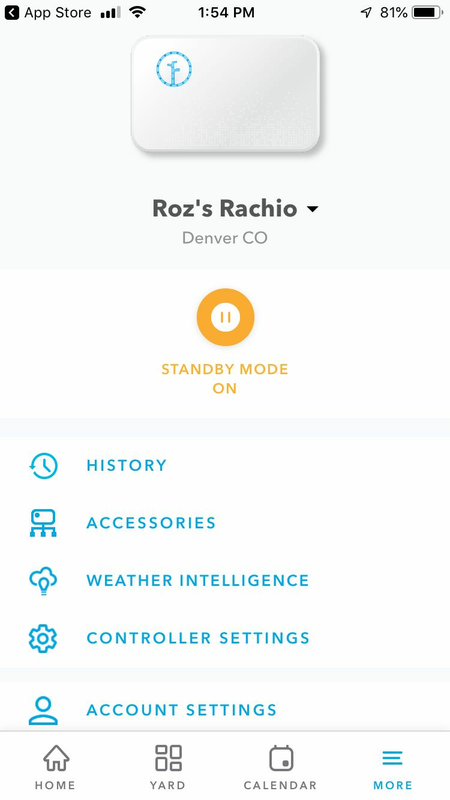 If you would like to set up a manual watering delay, this can be done very easily from the "More" tab of your Rachio app. Enabling a manual Water Delay will not stop any currently-running schedules; only future schedules will be prevented from running while the delay is active. Additionally, the manual Water Delay will SKIP the watering schedule(s) while active and does not make it up after the delay expires. At the top of the "More" tab, you will see "Delay Water". Simply click on this and a graphic will appear. Choose the number of days that you would like to delay watering. Once a length of time is selected, the Delay Water icon will state the date that the delay is set to expire. In the "History" tab, you will see a notification for this when a schedule has been skipped. Changed your mind and need to cancel a watering delay? Tap "Delay Water" in the More tab, then select "Off" to cancel the delay. Once successful, "Delay Watering OFF" will appear in your History feed. If you would like to manually skip a schedule that is due to run, this can be done very easily from the "Home" tab of your Rachio app. Manually skipping, then re-enabling a schedule will override any Weather Intelligence checks that would otherwise occur. As a result, skip thresholds may still be met, but the schedule won't skip. When on the Home screen, you can scroll to view a list of any upcoming schedules. Find the schedule that you'd like to skip and click the button that says "Skip." Your schedule will now be skipped and will show a new "Run" button. You can hit that button if you'd like to reenable the schedule. You cannot manually skip an hourly interval Fixed schedule. You can only skip the next occurring schedule. If you need to skip schedules for longer than the next schedule, consider Manual Delay.